This book marks an important evolution in Jean Baudrillard’s thought as he leaves behind his older and better-known concept of the “simulacrum” and tackles the new problem of digital technology acquiring organicity. The resulting world of cold communication and its indifferent alterity, seduction, metamorphoses, metastases, and transparency requires a new form of response. 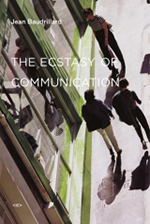 Writing in the shadow of Marshall McLuhan, Baudrillard insists that the content of communication is completely without meaning: the only thing that is communicated is communication itself. He sees the masses writhing in an orgiastic ecstasy of communications. Baudrillard navigates the Object’s maelstrom with the euphoria of the astronaut reentering Earth’s atmosphere with no possibility of assistance from Mission Control.